Out running with the club last night. No rain but there was a bitter wind and after we left the track and made our way to where we ran 2 k loops (around a landscaped tech park), the wind chill only got worse. We broke up into 4 groups according to speed and whizzed around 4 loops. At one point I considered giving up. However I persevered and it got better. I wore SealSkinz gloves, a vest and two running jackets plus Ron Hill tracksters and still felt overwhelmed by the impact of the wind. A large group of juniors were also running on the site and it was marvellous watching them suddenly apppear in a train form, running very smoothly and fast. Quite a few of them were kitted up in a top and shorts and seemed supremely comfortable. 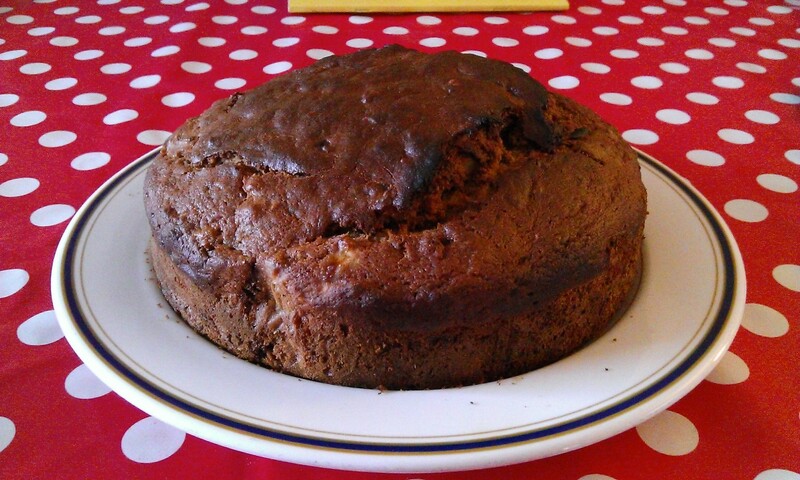 When I returned home with wind trauma, I immediately self medicated with this banana cake, having baked it earlier just in case the wind turned nasty. Decided not to run today and have a longer outing tomorrow. The River Cam is high at the moment and my son Nick had to negotiate a stretch of water covering the cycle path which runs into Cambridge. I’ll see if the path is usable and, if so, do another 10 miler. I might need to offer a sacrifice to the appropriate wind god. But which one? And which culture? Greek, Egyptian, Aztec, or Japanese ? I’ll offer a libation to Zeus and ask his advice. 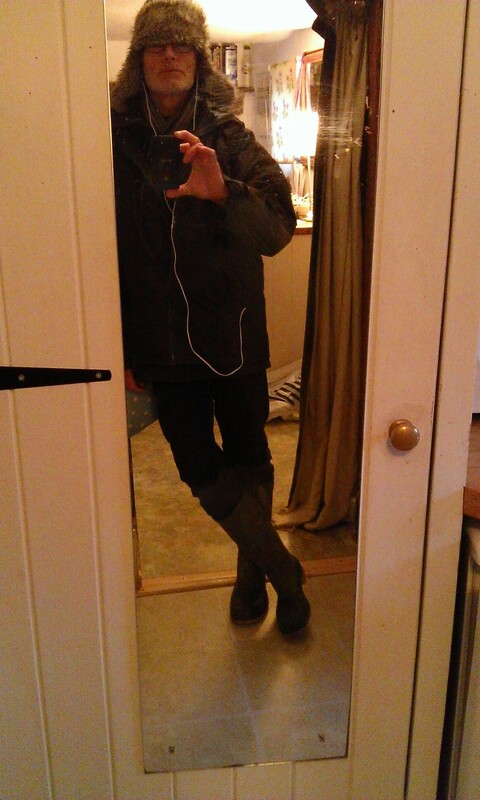 Here’s a gratuitous picture of me in a typical insouciant pose just before taking Rupert out for a walk. Let the elements do their worst ; my trapper’s hat will see it all off. I listened to America’s Horse With No Name while cooking this evening. Great lyrics! I particularly liked “In the desert you can remember your name cos there aint no-one for to give you no pain.” Nice triple negative. Does it mean there are no people who would do no harm to you but, by implication, plenty of people who are a threat to well being ? This entry was posted in extreme weather, food, food pictures, Pictures of food, Running, Uncategorized, wind and tagged cake, daft lyrics, exercise, Greek mythology, running, wind deities. Bookmark the permalink. I will. I think the Greek gods are ripe for a comeback. There are so many to choose from. Can’t do any harm, can it? No,but I’m expecting it to get better tomorrow if the prayers work.